As much as I love a luxury beauty experience, I must admit that I’m a bit more frugal when it comes to skincare products that don’t remain on my skin for very long. Face washes fall into this category. Though my definition of frugal may differ from yours, I find that a natural face wash that costs less than $20 is a great deal. And when it contains certified-organic, good-for-acne-prone-skin ingredients like Shea Terra Organics’ Tamanu & Licorice Clarifying Face Wash does, it’s a downright steal! 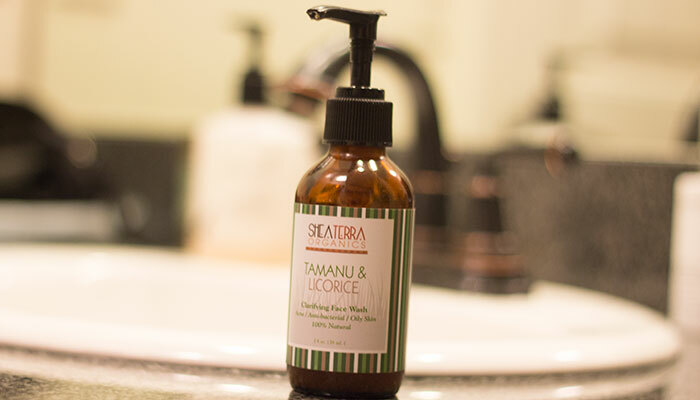 I’ve been using Shea Terra Organics’ Tamanu & Licorice Clarifying Face Wash for about three months. It serves as my evening face wash post-oil cleansing, and I’ve been happy with the gel texture, gentle suds and acne protection that it offers. One full pump is more than enough to fully cleanse your skin; you really just need about half a pump (unless you have a really big face?). The light yellow gel has specks of (what I believe is) licorice root and foams up easily when mixed with water thanks to the addition of electro salts that mix with organic sunflower oil, organic coconut cream oil and organic tamanu oil. I purchased Shea Terra Organics Tamanu & Licorice Clarifying Face Wash not because I was in desperate need of a face wash, but because I was drawn to the fact that it contains tamanu oil. As an acne-prone 28-year-old, I’ve had wild success with green beauty products that contain tamanu oil (a favorite right here). Shea Terra sources its tamanu oil from the island of Madagascar (and has been doing so for a decade!). Tamanu oil is known for its antibacterial, antifungal and anti-inflammatory properties, making it perfect for keeping breakouts at bay. It also encourages new cell growth, leading to smoother-looking skin. Not to be outdone by tamanu oil, licorice root, the other star ingredient in Shea Terra’s natural face wash, also has anti-inflammatory properties that can help soothe irritated skin and reduce blemish-induced inflammation. 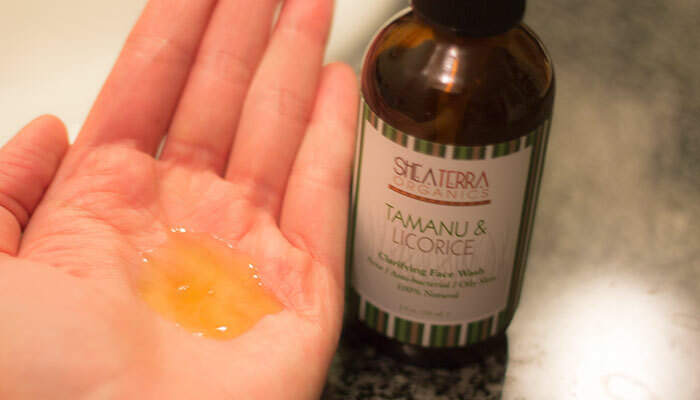 Shea Terra Organics Tamanu & Licorice Clarifying Face Wash is definitely one of my favorite natural face washes on the market. It satisfies my desire for a gel cleanser and appeals to the frugal face wash-buying girl in me. After using it for the past quarter, I know for sure it’s a repurchase as I”ve had some consistently lovely, clear skin throughout 2014. It’s not often that I can say that, and I’m a little nervous to switch to testing a new cleanser because of my satisfaction with this. How much are you willing to spend on a face wash? What are some of your favorites? Have you tried anything from Shea Terra Organics? Tell me in the comments section!